The Mets and deGrom agreed to a one-year, $17 million contract rather than go to arbitration in January. 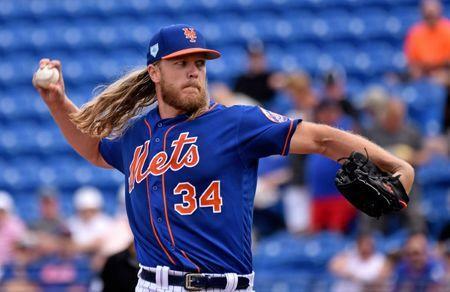 He is eligible to become a free agent in 2021, and Syndergaard said he doesn't want it to reach that point. This weekend, the Boston Red Sox and ace Chris Sale agreed to a five-year, $145 million extension, and the Houston Astros reached a two-year, $66 million deal with former Cy Young winner Justin Verlander. --Cleveland Indians All-Star third baseman Jose Ramirez was carted off the field after fouling a pitch off his left knee. --Catcher Erik Kratz will back up Buster Posey in San Francisco after the Giants traded for the veteran. --The Cleveland Indians signed infielder Brad Miller to a one-year major league contract. Kipnis has already been ruled out for Thursday's season opener at Minnesota. Miller, 29, hit .385 with two homers and three RBIs this spring in 12 games with the Los Angeles Dodgers. --Baltimore Orioles designated hitter Mark Trumbo will open the season on the injured list, manager Brandon Hyde confirmed. --The Astros finalized a two-year extension with Justin Verlander, the team announced. "Justin Verlander is one of the elite pitchers in baseball," said general manager Jeff Luhnow in announcing the deal with the team's ace. "His late-season arrival in 2017 helped the Astros deliver its first ever championship to the city of Houston. Our fans share in my excitement that Justin will be in an Astros uniform for at least three more years." The extension adds two years and $66 million to Verlander's current deal, which had one year remaining. It makes Verlander the highest-paid pitcher in terms of annual average value ($33 million). --The Chicago Cubs will option outfielder Ian Happ to Triple-A Iowa, meaning he won't start the season on the big-league roster. Happ, 24, was unhappy with the decision, according to manager Joe Maddon. He is expected to get time in center field, second base and third base. The Cubs also are hoping he'll get more comfortable batting from the left side of the plate. "I really don't blame him," Maddon said at spring training on Saturday. "The guy has really performed very well for us at different periods of time on the major-league level. He is so ingrained in the culture within the building and within the clubhouse. Great teammate. A lot of the veterans have accepted him very readily, which doesn't happen often with young players."